Posted bySareesh Sudhakaran	 May 28, 2015 April 17, 2018 2 Comments on For Filmmakers: How many Lithium Batteries can you Carry on an Airline? I’ve been researching how many Lithium batteries (rechargeable and non-rechargeable) one can carry on an airline (carry-on and checked in) without inviting persecution or penalty. It’s an important subject nowadays, because larger capacity batteries in the 200 Wh+ range are quite common, and somewhat cheap. Can you safely carry these onboard an airplane? That’s what this article intends to find out. What do the major airlines say? Batteries in the ‘less than 100 Wh’ range are termed ‘small’. Batteries in the 100-160 Wh range are termed ‘medium’ and batteries over 160 Wh range are termed ‘large’. Large batteries are a strict no-no for air travel. Extremely Important: The information provided here may be plain wrong or incorrect. Information if provided for informational purposes only. It does not constitute legal or professional advice. Please contact the airlines directly for legal allowances for all batteries. Do NOT use this article to make decisions. You are responsible for your own actions and safety. British Airways E (unlimited), S (4) E (unlimited), S (2) E only, no spares NO! *I’ve only chosen a few random airlines, please check with the airline you’re traveling with for special restrictions. ^ E stands for Equipment, i.e., batteries connected to the equipment they are intended for. S stands for Spare batteries. Many airlines allow you to carry a ‘reasonable’ or ‘unlimited’ amount of lithium batteries as long as they are less than 100Wh. However, what is ‘reasonable’? Surely if I carry 20 95Wh bricks on Cathay Pacific somebody will ruin my day (and trip!). Just to put some perspective on this, the average allowable carry-on weight is 7 kg. Each 95 Wh brick weighs about 750 g. If you have a camera or light fixture that needs this brick, it most likely weighs 1-3 kg, and then add another 1 kg for the bag (at the least). Let’s say you somehow have 3 kg left just for batteries. You can carry about 4 batteries without going over the limit. Therefore, I think we can safely say you shouldn’t carry more than 4 bricks in your carry-on luggage. Now let’s put a spin on this. What if you were forced to check-in your luggage? All airlines are pretty unanimous here – no spares in checked luggage. That means you’d better do your research very well on whether you’ll be forced to check in your baggage or not, because if you are caught napping, you’re going to have to leave a few batteries behind – best case scenario. If you’re planning on flying often, I don’t think carrying any more than 2-3 bricks per person is a sound strategy. Weight is one concern, but having to explain regularly why there are four bricks in your backpack is not fun. You could carry a second piece of equipment that can also take the same batteries, just in case you are asked to ‘connect it to your equipment’. Or, you could just hire an assistant to help you carry additional batteries. If you’re going to carry only two batteries, then it makes sense to make them count. You could definitely go for 130+ Wh batteries (up to 160 Wh) so you can work longer. However, some airlines reserve the right to let you onboard with even 2 batteries in the medium range. You might have to take special permission before you decide to show up at the check-in or security gate. If you have a second piece of equipment that can take the same battery, you can check-in one more to make it a total of three. So, which is a better strategy? 2x 130 Wh (carry-on) + 1x 130 Wh (checked-in)? What about price and charging? 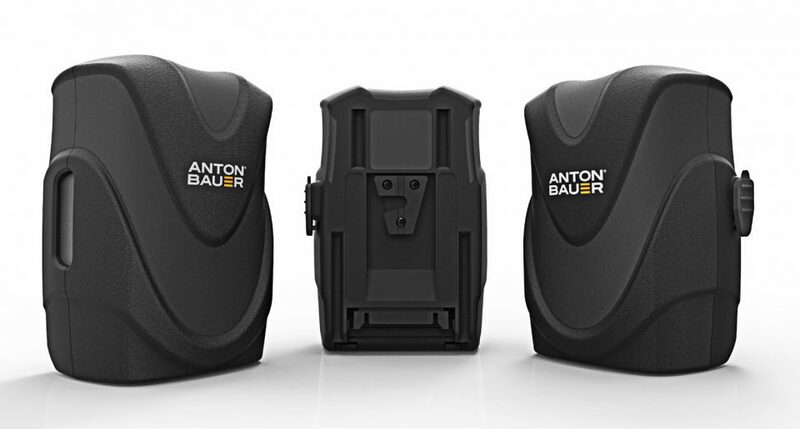 Price-wise, one Anton Bauer Digital 150 Wh battery costs about $477 ($3.18/Wh), while two Anton Bauer Digital 90 Wh batteries will set you back by $538 ($2.98/Wh). The price difference is hardly a factor here. If you have four 95 Wh batteries and you need to charge them at the same time, you need a quad charger. An AB Quad charger costs $989 and weighs 3.6 kg, while the dual charger costs $719 and weighs 3.2 kg. The quad charger is obviously bigger. Airlines – Do you need special permission and will you get it? If you’re traveling on an airline that doesn’t give you problems in the 100-160 Wh range, then I think the 130 Wh strategy is best. If you’re not sure, or you are sure the airline will give you issues, then the decision has been made for you. What about 160+ Wh batteries? Don’t even dare to carry any such thing to the airport. You might be fined or jailed or worse. These need to be shipped as special cargo as ‘dangerous goods’ – because they are. I’m no expert, so this is solely off the Internet. Don’t buy non-branded batteries whose origin you can’t be sure about. If you do, don’t fly with them. Protect the contacts from short-circuit by taping them with electrical insulation tape or putting each battery in a separate plastic container. Protect the batteries from rupture by giving them the same protection you do for your camera gear. Keep them away from external heat. When packing batteries, try to keep them separate. Unless specially allowed by the manufacturer, don’t charge lithium batteries when the temperature is below 0ºC. Declare your batteries while checking in. Never use a damaged or smoking battery. Never use a battery that emits fumes. Better airflow and heat dissipation Yes ? Temperature sensors and shutdown Yes ? Cushion against accidental drops Yes ? Many people complain about the larger size of the G90 batteries (it’s a 50% increase in volume), but the batteries are shock-proof to a large extent and the extra space allows for better heat dissipation. The disadvantage to the shape and size is that it takes up more space in your luggage. The first option is purely for carry-on. The second option assumes you can check in one more battery attached to another piece of equipment. I’ve just generalized on the capacity – 90 to 100 Wh could all be 95 Wh, and so on. 160 Wh could also be 150 Wh, but never more than 160 Wh. Blue means this is the best option. Orange means both could be options depending on priority (see below). Green is the second best option. White is the last option. Black means there’s no point in considering these for various reasons. 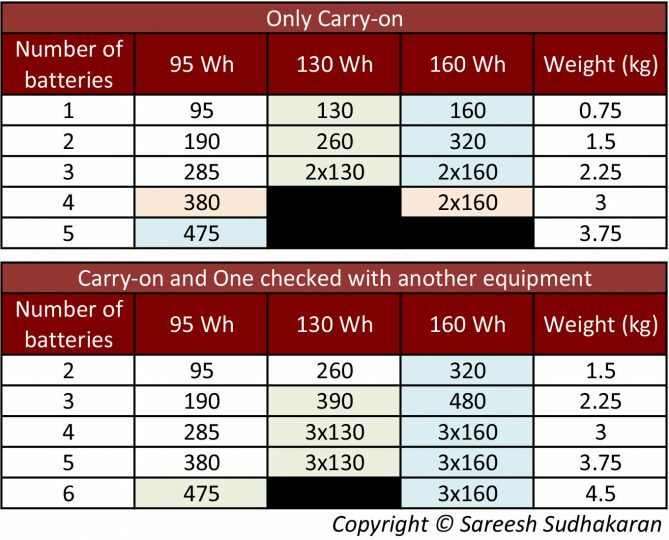 The choice between 4x 95 Wh batteries (orange box) and 2x 160 Wh batteries is dependent on size, weight and whether the airline will permit you to carry them. Assuming yes for the latter, the extra 60 Wh you gain might not be worth the doubling in size and weight. It’s your call. It’s always a good idea to have both 95 Wh and 130-160 Wh batteries in your kit, preferably two each (maybe three in the case of 95 Wh). This means you’re ready for any contingency. This only makes sense for regular fliers though. Good bricks and chargers are not cheap. For most of us, it’s either-or. My pick? Fly with two 150 Wh batteries, and a spare 150 Wh checked-in whenever you can. If the airlines permits you, a 130-160 Wh lithium ion battery strategy gives you the best bang for your buck, with considerable savings in size and weight as well. I hope this small but important article will help you manage your battery needs while flying. What do you think? Is my thinking correct? I think the key thing with batteries is not the batteries but who made them, can they be trusted, how they were designed if the firm making them is not established (say, 20 years of experience in lithium batteries without incidents). Also, if the firm is bought then “safety track record” starts over again in my view because usually in M&A the experts get retired (even though they claim otherwise to investors) and bean counters may put enthuastic junior “cost optimizers” in critical areas. It’s not political or racist to say that in terms of safety standards there are differences between countries, a lot of this has to do with culture and what personal repercussions are the for CEO and how easy it is to shield company from litigation/malpractise suits. In capitalism if you can find a way to make a quick buck with no risk, then why not, even if the product has a slim chance of exploding in customers customers customers gadget. With eg. some big old Japanese or German brand selling direct and making the product in their local factory, the whole brand is at risk if they cut corners or save too many pennies. With many subcontractors and hiding products behind many small brands (eg. Unilever), if there’s a problem with small brand X do by subsidiary or subcontractor etc, they are able to have more means for damage control. So while from accounting, lawyering POV it makes sense to shield the company and CEO from lawsuits, from battery buyer POV it makes more sense to buy from a company whose CEO is very personally committed to making their product is safe even if it costs 5x more. Unfortunately I don’t know any way besides trained dogs that could “smell” if a battery was made in China or Japan. Plastic made in different factories smell very different so dogs could be trained to detect if battery is made by trustworthy company and if the dog doesn’t signal on the battery then it’s potentially risky unknown battery. I would suggest *absolutely not* attaching your battery to a charger in order to check it in a bag. This is exactly how accidents happen. Current often flows in chargers when a battery is attached, even when not plugged in.